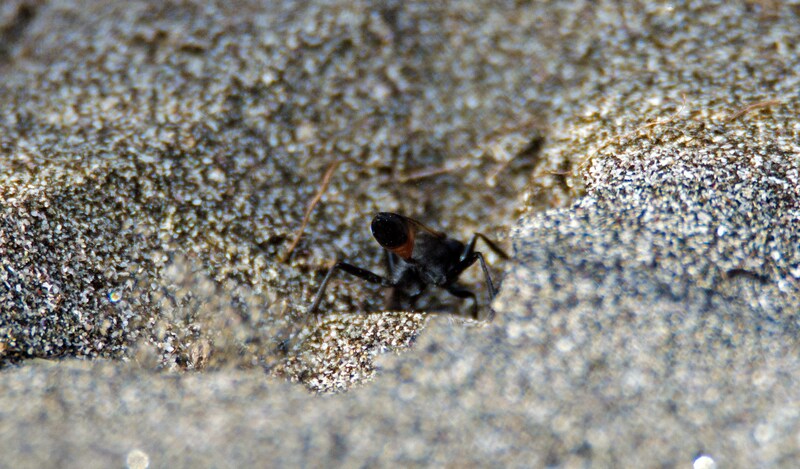 I came across this little sand wasp digging its heart out in the sand dunes on Morouzos beach, Ria Ortigueira, Galicia, Spain (see previous blog, 1). The Hairy sand wasp (Podalonia hirsuta) is common and widely distributed throughout Europe, but easily overlooked as it goes about it life on the dunes. 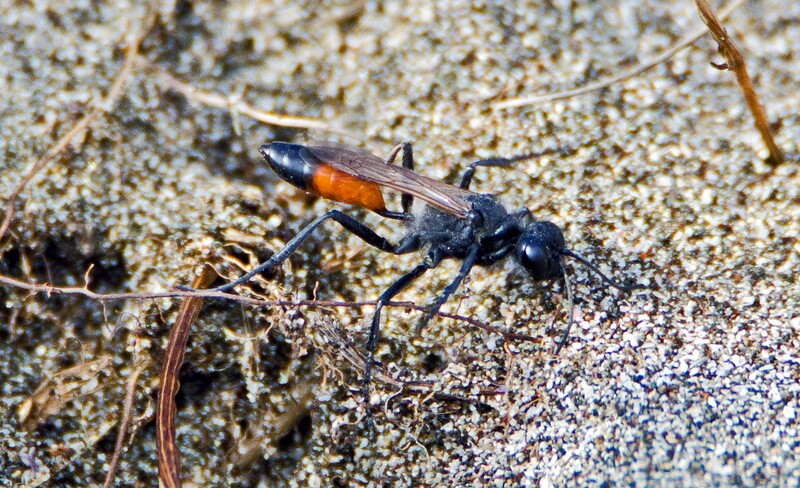 This species is similar to another sand wasp, the Red-banded sand wasp (Ammophila sabulosa), but the latter have much longer thinner abdomens; the waist of Podalonia hirsuta is shorter and widens abruptly into the abdomen. 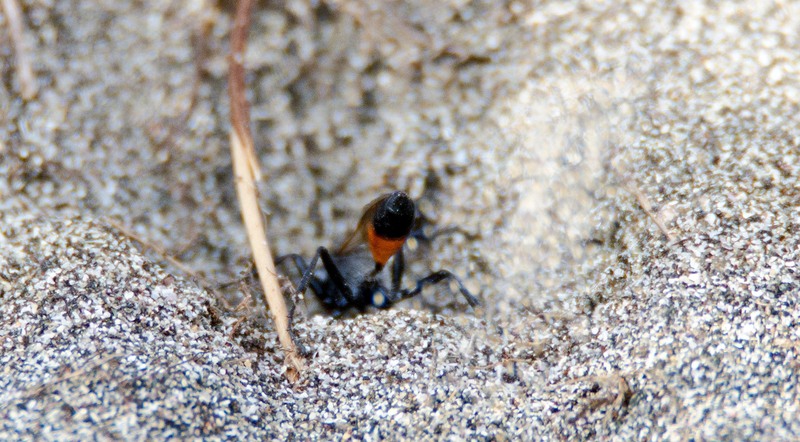 Another behavioural difference, is that the Hairy sand wasp generally captures and paralyses its prey before it starts digging a nest; it is the other way round with the Red-banded sand wasp. Apparently, the Hairy sand wasp finds and captures a caterpillar, then paralyses it, and then leaves it in a small tuft of vegetation whilst she goes about digging a nest. The one I was looking at was digging in one spot and then another, presumably looking for the best place for her offspring to reside in. When she has excavated a burrow of about 6-7 cm, she goes back and gets the caterpillar, pops the poor thing into the nest and lays an egg on it. She then seals it up and her larvae then feed and develop on the unfortunate caterpillar, which remains paralysed but not dead. I was struck by how energetic and hard-working this little insect was, throwing up grains of sand so quickly it was difficult to catch using still photography. There was just a little puff of sand behind it! Next Next post: Yellow and black larvae; red and black adults; what am I? Sorry Eric, I have not come across this species in Galicia, but I will keep an eye out for it when I go out there later this summer. I see that it stocks it’s nest with honey bees. 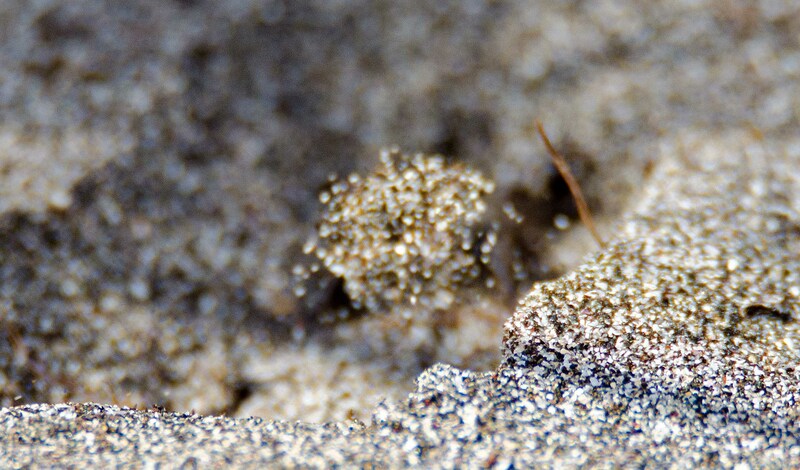 Ray Cannon's nature notes Little sand digger!